For some animals, the evening is just the beginning of the day. While buzzards and other day-active birds find a place to sleep in the trees, roe deer and owls wake up. At Lake Cerknica, evenings are quiet, because the lake is far from any city-noise. During our guided evening walk, can enjoy the evening atmosphere in nature in the evening at Lake Cerknica. We can start our excursion after dinner: there are several restaurants and tourist farms in the surroundings where you can enjoy an authentic Slovenian meal. Or, you can decide for a picknick with us at Lake Cerknica and we arrange home-made bread and many delicacies from local farms. When the sun goes down behind the mountains, life at the lake changes. Especially in springtime, thousands of green frogs start calling. In some places, we can hear the rare treefrogs as well. Occasionally we hear another frog-like sound. While it could be a green toad (this species has once been found at the lake), it is more likely the sound of a mole-cricket. These insects sing in underground tunnels and even when you stand just a few steps away from them, they sound as if they are very far. Later, in summer, other insects take over and we hear especially many bush-crickets singing at the lake. Either way, we will hear few human sounds, because the evening at Lake Cerknica is quiet, and we are well away from cities. 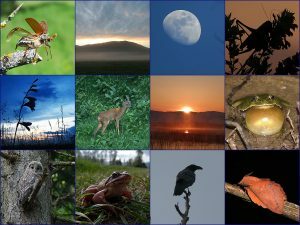 Surprisingly many birds are active at night. In the evening at Lake Cerknica, we may see owls hunting above the open land, but we especially hear many waterbirds. Coots, grebes, ducks and even herons can all be awake. Less familiar are the sounds of the corncrake and the spooky scream of the rail. On drier places, we can hear common quail and in the bushes around Lake Cerknica, nightingales sing until late. Altogether, we may hear more birds in the evening than in the middle of the day! When it is getting dark, bats start to hunt insects above the water. Amazingly, they orientate by listening to the echo of their high-pitched sounds. Many of these sounds are too high for human ears, but children and many young people can hear some of them. During our evening at Lake Cerknica excursion, we make the sounds from bats audible for everyone. 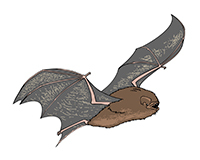 For this, we use a small device called a bat-detector which translates the high sounds in audible clicks and squeaks. With the light of a torch, we can also see the bats flying past, a fitting ending to an interesting evening! For 4-8 participants, the group price stays 90 € for the whole group. We can offer this tour from May until July – any day of the week, depending on the availability of our guides. We meet near Lake Cerknica. Please, keep in mind that late in the evening when the excursion ends, there is no public transport available. We can, if you like, book accommodation for you in the vicinity of Lake Cerknica. The starting point for this excursion is a 1.10-hour drive from Bled, 50 minutes from Ljubljana and 30 minutes from Postojna Cave. We think that tasty, high-quality meals are a very important part of any tour! Where possible we prefer it when we can eat local dishes, based on locally produced ecological products. Often, we include seasonal fruits and other farm products. This is why we like to include a picknick-dinner in this tour, which we enjoy in a beautiful, natural area. Our picknick consists of delicious home-baked bread and a variety of local products depending on the seasons together with home-made juice and Slovenian tea. You should expect an easy hike without altitude difference. However, we may walk outside paths, for instance along a meadow, and the ground can be uneven. This can be difficult to see at night! We cover a distance of 3-4 kilometre and will walk slowly. Many times, we stop to listen to the night sounds. This tour is suitable for children; we think that parents can best judge themselves if they can walk the distance and stay up late in the evening.